Home Sheducation Centre Is a Commercial Shed a Good Investment? Is a Commercial Shed a Good Investment? While we have provided Western Australians with thousands of residential and farm sheds over the years, our greatest value may be the commercial shed. The short answer to the question in the title is a resounding “yes.” Commercial sheds are great investments due to their relatively low costs compared to bricks and mortar. Let’s take a look at some of the factors involved. Cost is a huge factor in any investment. The idea of investing is to maximise and monetise every square metre of space that you have. The old adage “buy low, sell high” applies here. If you need an industrial building to either rent or for a warehousing, distributing or office facility, it can cost millions of dollars less to build an industrial shed than it would to build to the same specifications with bricks and mortar. At this point, an industrial shed can be built with every function you would find in a comparably sized bricks and mortar building. In addition, our industrial sheds are built to withstand any weather that is considered standard for its area. 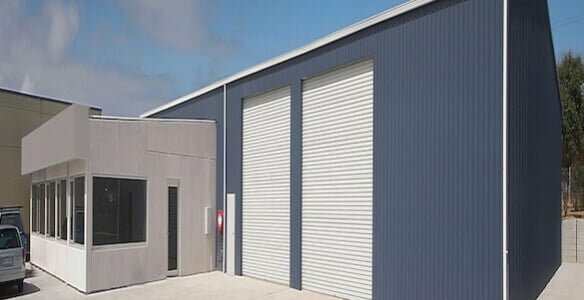 We take into consideration such factors as wind speeds, terrain, applications and climate when building an industrial shed to ShedSafe standards. Due to modern advances in facades, we can build an industrial shed that looks nothing like a shed. In addition, we can supply such extras as wall cladding, personal access doors, dividing walls, roller doors and windows. Basically, we can make your industrial shed look like any other office building on the inside. We can also make the outside look like a traditional building if you like. We have built some large industrial facilities and all have been relative bargains for the owners. Many times, building or buying and remodelling a facility can restrict or hinder entry into higher levels of business. Sometimes the money that can be saved by using an industrial shed instead of bricks and mortar can be just enough to help secure funding for a business. While resale value may not be as high as with bricks and mortar, an industrial shed helps a business obtain positive cash flow due to lower debt service costs.